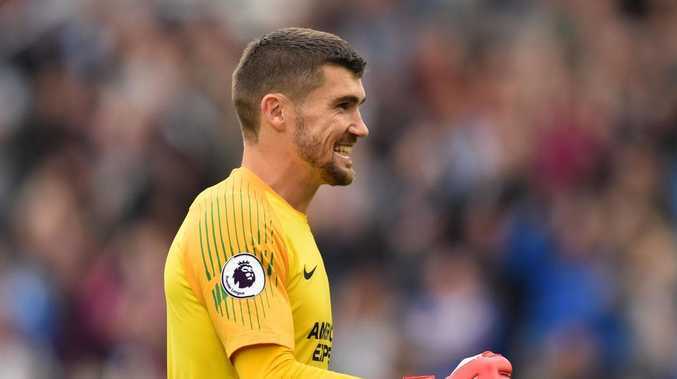 SOCCEROOS goalkeeper Maty Ryan has been rewarded for his incredible run of form by scooping the PFA Fans' Player of the Month Award for October! The Brighton stopper actually tied with Arsenal striker Pierre-Emerick Aubameyang in the fan vote, but took home the award after playing more minutes than the in-form striker - the tie-breaker for the award. Other nominees included Manchester City's Fernandinho, Chelsea's Ross Barkley, Manchester United's Anthony Martial and teammate Shane Duffy. The PFA labelled the vote 'one of the closest monthly competitions we've ever run,' with the Socceroo emerging victorious by the most slender of margins. Ryan kept three consecutive clean sheets in October, and made more saves than any other goalkeeper in the English top flight. He's also nominated for the Premier League Player of the Month Award which will be announced later this month.